Rangers duo Barrie McKay and Lee Wallace have been named in Gordon Strachan's Scotland squad for impending friendlies against Italy and France. But there is no place for Celtic striker Leigh Griffiths, who scored his 40th goal of the season on Wednesday. Hearts right-back Callum Paterson has also been brought in while Hibernian midfielder John McGinn keeps his place, but Aberdeen's Kenny McLean drops out. Scotland face Italy in Malta on 29 May before playing France on 4 June. 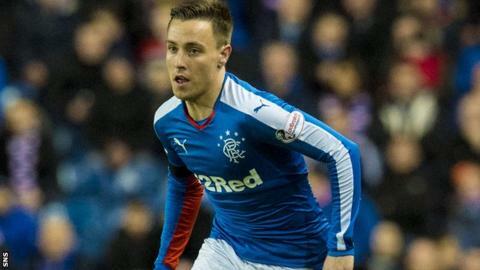 Uncapped McKay, 21, has scored nine goals this season from the flanks while left-back Wallace, 28, has been a model of consistency in leading Rangers to promotion and the Scottish Cup final. "They've had a terrific season," manager Gordon Strachan noted. "As a partnership they work brilliantly together. It's as good a partnership as I've seen for a long time. "Both appreciate each other's contribution and they both know what they're good at, and they both help each other all through the games. So I think it's worth the two of them coming together." Strachan said he chose to leave players from Celtic and Aberdeen out of his squad so they can be rested before crucial European ties with their clubs at the start of next season. Aberdeen face a Europa League qualifier on 30 June, while Celtic start their Champions League qualifiers on 12/13 July, but McLean and Griffiths had both declared themselves keen to be involved. "I'm the Scotland manager. My job is to get the best for Scottish football," Strachan added. "I'm trying to give them as much rest as I can so they can be ready for their European ties. "It might be a bit of a gamble, I could have done with some of them." Craig Gordon, Kieran Tierney, James Forrest, Griffiths and Scott Brown - who has been playing through the pain of inflamed hamstrings - are all rested. But Celtic defender Charlie Mulgrew is in the squad, with Strachan pointing out he may not be at Parkhead beyond the end of the season. "He will maybe not be a Celtic player when we play the second game. His contract is up. So that's the reason Charlie is there. But Charlie has had a stop-start season and I don't think he needs as much of a rest." Hearts will also face a Europa League qualifier at the end of June, but Strachan said Hearts head coach Robbie Neilson was keen for right-back Paterson, 21, to gain more international experience. "He has also had a six-week break as well with his injury, so that's the reason Callum is in there," Strachan explained. "He is a goal threat, he can get forward and cross, he has a good physique about him, and he will get better and better because he is still a young fella." Norwich striker Steven Naismith returns to the squad after pulling out of the friendly against the Czech Republic in late March, a 1-0 win Scotland repeated against Denmark five days later. Nottingham Forest winger Oliver Burke keeps his place and Crystal Palace midfielder James McArthur is recalled after recovering from injury, while Fulham striker Ross McCormack - a late call-up for the previous friendlies - has earned another chance. But Leeds duo Liam Cooper and Liam Bridcutt, Norwich defender Steven Whittaker, Wolves midfielder Kevin McDonald, Brighton forward Jamie Murphy and Blackburn striker Tony Watt all drop out. Despite five goals in his last eight matches, Middlesbrough striker Jordan Rhodes has again been left out.